"In any event, it is beyond dispute that Babur's descendants presided over a virtually unprecedented efflorescence in Hindu religious activity. Hinduism as we know it today - especially the Hinduism of north India - was essentially shaped under Mogul rule, often with the active participation and support of the rulers and their officials and feudatories. The Ramcharitmanas, for example, the version of the Ramayana that was to be canonised as the central text of north Indian devotional practice, was composed in Akbar's reign by the great saint-poet Tulsidas. The early years of Mogul rule also coincided with a great renaissance in the theology of Krishna. It was in this period that Rupa Goswami and other disciples of Chaitanya Mahaprabhu rediscovered and mapped out the sacred geography of the Krishna legend. Brajbhumi - the region that is most sacred to Krishna bhakti - lies between Agra and Delhi, the two principal centres of Mogul power in the 16th century. The road connecting these two imperial cities runs right past the sacred sites of Braj. It is self-evident that if the Moguls had wished to persecute Vaishnavites they could easily have done so. But far from suppressing the burgeoning activity in this area, Akbar and his nobles actively supported it. The Hindu generals and officials of his court built several of the most important temples in this area, with Akbar's encouragement. Akbar was personally responsible for sustaining some of these temples: he granted land and revenue in perpetuity to no less than 35 of them. Hinduism would scarcely be recognisable today if Vaishnavism had been actively suppressed in the 16th century: other devotional forms may have taken its place, but we cannot know what those would have been. It is a simple fact that contemporary Hinduism as a living practice would not be what it is if it were not for the devotional practices initiated under Mogul rule. The sad irony of the assault on the Babri mosque is that the Hindu fanatics who attacked it destroyed a symbol of the very accommodations that made their own beliefs possible." "These views are problematic from several perspectives. Tulsidas was patronized not by Emperor Akbar (the saint does not even mention him, and instead refers to the rule of 'yavan' or barbarians in India in his Dohavali) but the devotedly religious Hindu noble Man Singh who worked for Akbar. The same Man Singh, a trusted commander of Akbar, and a nephew of his wife now commonly known as Jodhabai, was responsible for patronizing the Goswamis of the spiritual lineage of Chaitanya Mahaprabhu. It is somewhat misleading to say that Rupa Goswami and other disciples of Chaitanya Mahaprabhu mapped out and rediscovered the sacred geography during the Moghul rule. First, this enterprise was the inspiration of Chaitanya, and the Moghuls had nothing to do with it. And chronologically speaking, Rupa Goswami lived in Vrindavan before Akbar's patronage started, and he died before the grants of Akbar. The only Goswami out of the six who survived by the time the temples of Vrindavan were constructed was Jiva Goswami. Ghosh makes much of imperial grants to Vaishnava temples during the reign of Akbar, ignoring that these very temples were then demolished in dozens during the reigns of his successors like Aurangzeb barely in less than a 100 years after their construction. The temples of Vrindavan built by the inspiration of Rupa Goswamin and other disciples of Chaitanya Mahaprabhu were attacked and destroyed (partially or fully) by Aurangzeb and their sacred Icons were taken to Jaipur, Karoli and other safe sites in Rajasthan under Hindu Rajput control. The reasons why Rupa Goswamin etc went to Vrindavan were different from what Ghosh implies, who conceals the fact that they were fleeing Islamic religious persecution elsewhere. When Husain Shah, the ruler of Bengal, asked Sanatana to accompany him on the Orissa expedition, the latter refused saying "you are going to desecrate Hindu temples and break images of Hindu gods; I cannot accompany you". The furious king thereupon imprisoned Sanatana who however managed to escape by bribing the prison guards. Both brothers (Sanatana and Rupa Goswami) thereafter renounced the world and went to Vrindaban, where they wrote treatises on Gaudiya Vaishanavism. [See R. C. Majumdar, History of Mediaeval Bengal, G. Bharadwaj and Co. 1973]. It was not the lure of Akbar's grants but the inspiration of their Guru Chaitanya Mahaprabhu to reclaim Vrindavan from continued desolation, and religious persecution back home in Bengal that motivated them to make Brindavan their home." Lord Caitanya met the two brothers Dabira Khasa and Sakara Mallika in a village known as Ramakeli in the district of Maldah, and after that meeting the brothers decided to retire from government service and join Lord Caitanya. Dabira Khasa, who was later to become Rupa Gosvami, retired from his post and collected all the money he had accumulated during his service. It is described in the Caitanya-caritamrta that his accumulated savings in gold coins equaled millions of dollars and filled a large boat. He divided the money in a very exemplary manner, which should be followed by devotees in particular and by humanity in general. Fifty percent of his accumulated wealth was distributed to the Krsna conscious persons, namely the brahmanas and the Vaisnavas; twenty-five percent was distributed to relatives; and twenty-five percent was kept against emergency expenditures and personal difficulties. Later on, when Sakara Mallika also proposed to retire, the Nawab was very much agitated and put him into jail. But Sakara Mallika, who was later to become Srila Sanatana Gosvami, took advantage of his brother's personal money, which had been deposited with a village banker, and escaped from the prison of Hussain Shah. 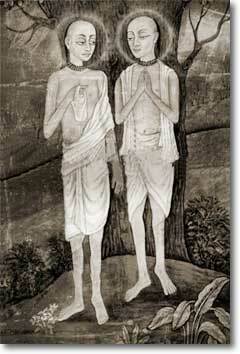 In this way both brothers joined Lord Caitanya Mahaprabhu." "The period of his [Akbar's] rule, from 1556 to 1605 A.D., coincided with the pastimes of the Six Goswamis who, having follow Lord Caitanya's orders, had gone to Vrindaban to write. Just two years after Akbar came into power, in 1558 A.D., Sri Jiva Goswami purchased the land at Seva Kunj. Sanatana Goswami disappeared that same year, and Sri Rupa Goswami disappeared six years later. By this time, the fame of the Six Goswamis had spread far and wide, and in 1570, Emperor Akbar came to Vrindavan to meet the famous Jiva Goswami, who led the Mughal leader blindfolded into the sacred kunja at Nidhuvana. So moved was Akbar by this experience that he gave permission for the construction of four great temples of Sri Krsna: the temples of Govindaji, Gopinatha, Madana-mohana and Jugal-kisore." "The cause and effect relationship between Mughal rule and efflorescence of Hindu Vaishnavism that Amitav Ghosh suggests simply does not exist to any significant degree. Not only did dozens of Vaishnava saints thrive outside the regions and periods of the Mughal influence, it is an insult to the intelligence and vitality of Hindus to suggest that Moghul emperors were an impetus to the development of some lasting Hindu traditions that continue to this day." Regardless of any seemingly benevolent acts Akbar conducted in Vrindavan, which may have counteracted some of his sinful activities, he nonetheless died a violent death at the hands of his eldest son, Jahangir. Jahangir also destroyed Vaisnava temples and terrorized the devotees, and he too was killed by his own son.